The Friends Chat (previously known as "Clan Chat") feature allows you to speak to a group of players all at once, without the need for any special programs. It is particularly useful for clans, although you could even use it to talk to a group of friends all at once. This guide will tell you how to join, use, create, and assign rankings for people in your "clan". To start off with, you are going to need to go to the Friends Chat menu. If you currently do not know where it is, it is by the friends list icon, and it has two smiley face people on it. Also using a keyboard shortcut, you may also press F7 to get to this menu. Now that you have found the Friends Chat menu, you are ready to start learning about it. When you click on it the screen should look a little like the below picture, except without the numbers. The numbers are going to be the order that each part of the Friends Chat menu this guide will cover. 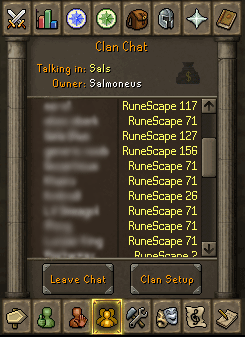 This part of the Friends Chat menu tells you who exactly is in the clan chat channel you are currently talking in. From this list, you can also add these people to your friends list or ignore list, in case you want to talk to them privately or don't want to listen to what they have to say. Players listed in green are currently on your server, while names in yellow are on a different server. There are also specific icons for what ranking you have. To learn more about these, please read on. 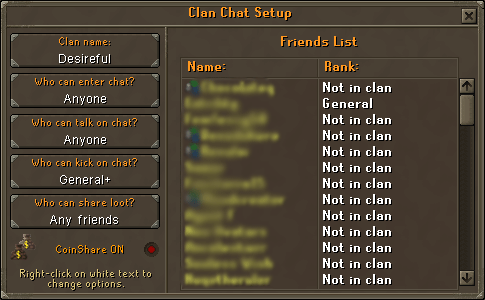 To join someone's Friends Chat, you must type in the person's username, not the clan channel's name. So let's say someone wants to go to my clan chat. They would type in "Desireful3" (without the quotes) into the box when the message comes up. Press enter and you can now talk to whoever is there. If you logged out while last in a chat, you will automatically be put into that Friends Chat upon logging in. If you leave a chat and go to a different chat, the last Friends Chat name will be in the box (shown below). This is for cases in which you forget a persons username. To create and edit your Friends Chat setup, choose the option "Friends Chat Setup" in the Friends Chat menu. There are several options you can choose from this screen. This includes "Clan Name," "Who can enter chat? ", "Who can talk on chat? ", "Who can kick on chat? ", "Who can share loot? ", the option to turn CoinShare On/Off, and there is your friends list. 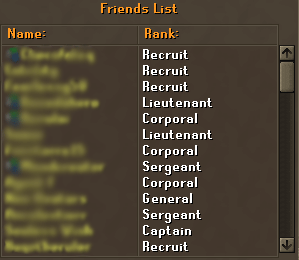 Alongside your friends' name, there are rankings, if there happens to be one. 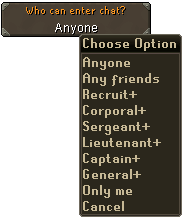 When you click this option, you can decide what your clan name will be. This is not the name you type in to reach the Friends Chat, but what it's called. So if I named my chat "Sal," then before everyone's reply it would look like "[Sal] Name: Text would go here. "If you want to tell someone about a clan, you use the clan name in reference, but if you would like to get on the clan, you would have to type in the owners username. Also, if you right click on it, select the second option "Deactivate Channel" to deactivate the channel. When you right click on this option, you can choose who can enter your chat. 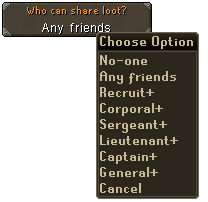 Therefore, if all of your clan members were on your friends list, then you would select the option "Friends." This way, people not in your clan, cannot get into your chat. It's worth noting that anyone added to the chat owner's Ignore List will not be able to join the chat. So if someone is causing problems, you can add them to this list. When you right click on this option, you can choose who exactly can talk on this chat. This is separated by groups like "Friends," "General," or "Anyone." 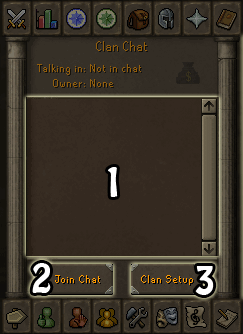 So if you wanted to have a private chat with a couple people of your clan all at once, you would use this feature. If you want to know how to make players in a certain group, please continue reading. Now you're probably wondering, "How could I kick someone online?" Well, sorry to burst your bubble, but that is not what this feature is used for. It is basically like bumping a certain person off your Friends Chat. When kicked, they cannot access your channel for the next hour. You would only need to use this feature if they are breaking the RuneScape rules or just spamming up the place. When the time comes, you will know when it will be necessary to kick someone. Also, a lower-ranked person cannot boot a higher-ranked person. If you and your clan are attempting the KBD together, everyone is probably going to want some of the drops. However, there are always those soloers that might just join your Friends Chat for a chunk of gold coins. To keep this from happening you can set the "Who can loot?" tab to prevent outsiders from getting the rewards from a drop. 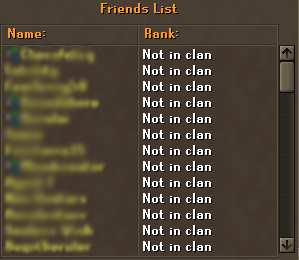 The friends list is to show people in your clan that are on your friends list. It will also show if you have ranked that specific person in a certain title in your clan, like "General." This helps a lot so you won't have to remember all of this. It also shows you your friends list, so now you can access your friends list in two places, except you won't be able to chat in one of them. 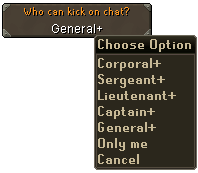 Note: If a Jagex moderator happens to come upon your channel, you can assign that person to any rank you wish, but they will still be able to kick people, no matter what rank. Currently, ranks only have two abilities. One of them is to kick other players. For example, a Captain could kick a Recruit, but a Recruit cannot kick a Captain. The other ability ranks have is whether you can talk in a certain channel. For example, the channel's owner could change the channel settings to only allow Lieutenant and up talk/enter the channel. The LootShare options allows you to share monster drops with your fellow clan members. To set up the Lootshare option, click on the "Clan Setup" button and then select the "Who can share loot?" option to change the lowest rank one must have in order to share loot. Once this has been changed, it will take two minutes to take effect. There are a few things to remember about Lootshare. First, this option will only work in a multi-combat zone; it will not have any effect while fighting in a non-multi-combat area. Loot will only be shared with clan members in the same area as your group, so someone outside of the Lootshare radius will neither get any loot or share their loot with the rest of the group. Your chance of getting some loot from another clan member's kill increases each time someone else gets some loot from a creature. Freeplay: 7, 10, 11, 14, 29, 30, 33, 34, 37, 40, 47, 85, 94, 95, 106, 108, 113, 117, 118, 123, 126, 127, 134, 142, 153, 154, 155, 169. Members: 9, 12, 22, 23, 26, 28, 39, 46, 48, 59, 64, 54, 76, 84, 88, 89, 91, 92, 97, 98, 111, 112, 124, 131, 137, 145, 151, 157, 158, 159, 168. Now that you have your channel all set up, you can begin to tell people about your Friends Chat and begin chatting! To talk in the Friends Chat, you must type a "/" before each message. This is basically for when you have your viewing the "All" chat, so you can talk to your clan and to the people next to you. It's quite simple and you should get the hang of it easily.